Free Nourish and Shine Gift! with a £35 Spend on Shu Uemura! Limited Edition Range - La Maison Du Chocolat! Enriched with an indulgent chocolate scent! Repair & Strengthen Damaged Hair! Get the most out of your favourite Shu Uemura range with the full regime and stock up for less, allowing you to treat your locks for even longer. Watch your hair transform daily with some of the best haircare products around, no matter what type of hair you have. A limited edition collection of best-selling Cleansing Oil Shampoo, Essence Absolue & Blow Dry BB Serum with an indulgent chocolate scent. Cleanse and rinse away excess oil and product with this energising and refreshing shampoo, designed to leave your hair feeling squeaky clean with beautiful radiance. Here you will find a Cleansing Oil Shampoo to suit your individual hair type, so sit back and relax while the Shampoo works it magic leaving your hair looking in great condition, with a weightless shine and super-soft touch. The answer to your dry hair problems, Essence Absolue is created to soften, smooth and deeply very dry hair. A blend of concentrated Camellia oil will help to eliminate frizz and impurities while providing a beautiful shine without weighing the hair down. Camellia Oil is also known for being one of the most rapidly absorbing oils, allowing your hair plenty of moisture and a soft finish. Worried about the vibrancy of your hair colour? Worry no more! The Color Lustre range is enriched in Musk Rose Oil to help intensely nourish hair fibre for a soft, shiny finish, while Goji Berry Extract helps to prevent colour fade and changing of hair colour. Not only does this range contain hair products to maintain hair colour and vibrancy, but it also contains Hair Shade Reviving Balms to help bring your hair colour back to life. Ultimate Reset is your go-to range for very damaged hair, bleached, coloured, permed or straightened hair in need of some TLC. 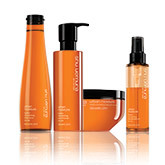 Repairing hair from root to tip, the formula helps to promote healthy, shiny hair. Blast your hair with long-lasting volume whilst deeply hydrating, the Muroto Volume range is ideal for fine, weak hair in need of fortifying and nourishing. Designed to strengthen the hair fibre for a voluminous, weightless touch, these products are infused with Depsea Water to help provide essential nutrients for fine hair in need of reviving and a super-soft finish. The Urban Moisture range is specifically designed to intensely nourish and hydrate dry, weak hair for a smooth and supple touch full of shine. This range is great for protecting your hair against environmental aggresors, such as pollution and dust, for the ultimate soft, shiny finish. 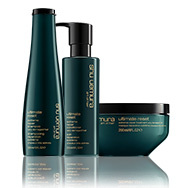 Enriched with hydrating moringa extract, the essential oils intensely hydrate and purify dry, brittle hair. 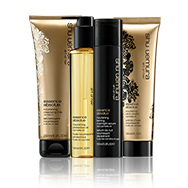 The Silk Bloom range is designed to restore and repair damaged hair in need of a moisture boost. This range will help to strengthen the hair fibre, while Argan Oil works deep within the hair to smooth and strengthen and repair the bonds between the hair cuticle. Known for its regenerative properties, Argan Oil plays a big part in leaving your hair beautifully shiny, soft and smooth. The Shusu Sleek range is suitable for coarse, unruly hair, designed to tame and smooth frizz. Black Cumin Oil blasts the hair with deep nourishment, smoothing each strand and removing any unwanted frizz. Black Cumin Oil is known as one of the most powerful natural antioxidants, therefore leaving your hair feeling super-soft and replenished. Shu Uemura Art of Style brings you a range of styling products to suit your type of hair. Create a variety of styles and textures and beautifully shape your hair. 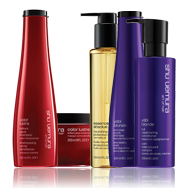 All Shu Uemura styling products can be used separately or blended and layered together to create any chosen style. 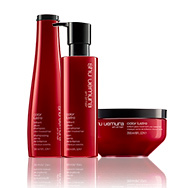 All Shu Uemura styling products protect hair from UV damage, heat styling and humidity. 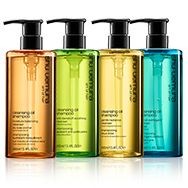 View all Shu Uemura Hair products in one place. Not sure what you are looking for? Simply select your hair requirement and product type and you're sure to find the perfect products for you. Shu Uemura Art of Hair combines the intelligence of rare, natural ingredients with innovative technology to create a hair care range that enhances the natural beauty of hair with a flawless result. Harnessing the very best of natural ingredients that are rich in antioxidants and protecting properties, such as argan oil, depsea water and camellia, Shu Uemura Art of Hair replenishes the hair's needs without overburdening for a flawless, healthy touch. Shu Uemura Art of Hair products including Shu Uemura Art of Hair Shampoo and Shu Uemura Art of Hair cream from the various Shu Uemura Art of Hair ranges. Here’s our easy guide to finding the perfect range to suit you..
A handy 5-in-1 product, meaning less product used with all of the benefit of more! 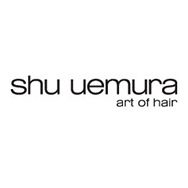 Shu Uemura Art of Hair combines the intelligence of rare, natural ingredients with innovative technology to create a hair care range that enhances the natural beauty of hair with a flawless result. Harnessing the very best of natural ingredients that are rich in antioxidants and protecting properties, such as argan oil, depsea water and camellia, Shu Uemura Art of Hair replenishes the hair's needs without overburdening for a flawless, healthy touch. Shu Uemura Art of Hair products including Shu Uemura Art of Hair Shampoo and Shu Uemura Art of Hair cream from the various Shu Uemura Art of Hair ranges. The Essence Absolue range includes an array of products designed to deeply nourish and protect hair, including the Essence Absolue Murakami. Essence Absolue Murakami comes in a beautiful bottle designed by artist Takashi Murakami and works to nourish and repair the hair while fighting dryness and frizz and protecting against UV damage. The Shusu Sleek range is specially designed to smooth and nourish unmanageable and frizzy hair for a satin-soft, shiny finish. The range is developed with density reduction to reduce drying time and leave hair with a controlled, fluid touch and includes the Shusu Sleek Treatment Masque. The Shusu Sleek Treatment Masque is a deeply conditioning haircare treatment that replenishes moisture to unruly, tangled hair for a satin-soft, shiny finish. The Urban Moisture range has been developed to hydrate and nourish dry hair, while protecting against the pollution of urban living. The range includes the Shu Uemura Urban Moisture Hydro-Nourishing Double Serum, which provides a shield for your hair and is enriched in Moringa Oil and Red Algae to help moisturise and protect hair from the inside out. The Muroto Volume range is designed to tone and strengthen the hair, leaving fine hair resilient, manageable and easier to style. The Muroto Volume Shampoo and Conditioner are enriched with a blend of concentrated Himalayan Crystal Minerals such as potassium, iron and magnesium, renowned for their fortifying properties. With a range and product for every hair type, and hair requirement, with Shu Uemura you can rest assured your hair will be left enhanced and with a flawless finish.